How do we as born again believers overcome evil? We have to put on the full armour of God to fight spiritually against evil. 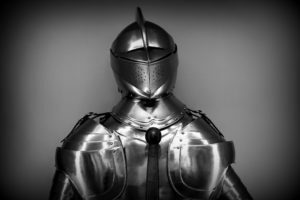 What is the armour of God and how do we use it? For shoes, put on the readiness to preach the Good News of peace with God. Our enemies are not other human beings who do wrong against us, but against evil spirits who use such people. These are the “evil rulers and authorities of the unseen world, against mighty powers in this dark world, and against evil spirits in the heavenly places” referred to in verse 12. Therefore, do not fight the person but resist the evil spirit using that person. 2. We do this by “putting on” the full armour of God. This means in life, we will have battles, even if we are born again Christians. But, God has given us weapons with which we fight the evil spiritual forces that are behind the troubles we face in life. It is these weapons that allow us to overcome the enemy and “stand” after the battle is over. 2.1 Put on the “belt of truth”. This means we must rely on the Word of God. It is the knowledge of the truth of the Word that gives us the foundation on which we stand against the devil. 2.2 Put on the “breastplate of righteousness”. The breastplate protects the body’s vital organs, particularly the heart. Righteousness means being in good standing with God, i.e. having a right relationship with God. Putting on the breastplate of righteousness means being secure in our hearts that we are in right standing with God. We do this by: (i) reminding ourselves that we have been cleansed of our sins by the blood of Christ; and (ii) by repenting of our sins and asking for forgiveness from God when we make mistakes [1 John 1:9]. 2.4 Hold up the shield of faith to stop the fiery arrows of the devil. The primary weapon of the devil is to deceive us by causing us, through circumstances, to constantly question our belief in the Word of God so that we start doubting its truth, and in the end to lose our faith in God. This means our belief in the promises of God (and even our belief in His very existence) will be challenged by the devil through attacks – the “fiery arrows” referred to in verse 16. These may arise through circumstances such as being afflicted with sickness/disease, suffering hardship (such as poverty), failure, rejection or fear. The aim behind such attacks is to make us doubt that what God has promised in His Word is true. To hold up the shield of faith means encouraging ourselves by reminding ourselves (in the middle of such negative circumstances) of the promises of God and holding on to them as absolute truth in the face of fierce “fiery” attacks of the devil – especially when we do not see any difference happening to our negative circumstances. It is holding on to these truths (i.e. having faith) that will overcome them. 2.5 Put on salvation as your helmet. The biggest battlefield is our minds. The devil intends to wear us down and discourage us into doubting who we are in Christ. In that way, he can get us to doubt our identity as born again children of God. If we are sufficiently discouraged, we can easily start backsliding and give up on our relationship with God. Putting on salvation as a helmet means holding on to our identity – constantly reminding ourselves that we are born again, new creatures in Christ. Knowing that we are God’s children encourages us to stand against the devil knowing that God sees us as righteous and redeemed. Therefore, the devil has no authority over us – even if he attacks and causes difficulties in our lives. 2.6 Take the sword of the Spirit, which is the Word of God. We need to respond to evil attacks by speaking the Word of God against the negative circumstances of evil rising against us. Because as born again believers, we not only have the presence of the Holy Spirit in us to guide into all spiritual truth by reminding us of the teachings of Jesus Christ, but we have the authority to use God’s Word against every negative circumstance in our lives, in the name of Jesus. Jesus set an example for us in this regard when He was tempted by the devil in the wilderness. To every temptation of the devil, He responded by quoting the Word against the deception and temptations from the devil. By speaking the Word of God into our circumstances, using the name of Jesus, we effect a change to such circumstances. 2.7 Pray in the Spirit at all times and on every occasion. The Holy Spirit prays the will of God over our lives when we pray in the Spirit. [Romans 8:26-27]. As we pray in the Spirit, we strengthen ourselves. [Jude 1:20] It is this inner strength that helps us to stand against the devil. With these weapons of God freely at our disposal, we overcome the devil. However, this can only happen in our lives once we have received Jesus Christ as Lord and Saviour.